Abstract: Patsy Sutley moved to El Monte in 1964, after moving to California from Amarillo, TX, where she was born and raised, two years prior. Her children attended schools in the Mountain View District and then Mountain View HS. She began work as an aide in the Mountain View District in 1973 after being a parent volunteer and “room mother” for her children, and became President of the CSEA (Classified School Employees Association) for Mountain View in 1989-1990, a post she held for 14 years. After retiring in 2002, she stayed active in school board politics, and has sat on the Mountain View Board since 2009. Ida Werrett moved to El Monte from Idaho at the age of 15 and attended El Monte High School. She got married shortly after high school and moved to South El Monte, and started as an aide in her children’s school in 1972. She was Vice-President of the CSEA when Patsy was President. Patsy and Ida were very excited to talk about a period of intense conflict in the Mountain View District from 1989 to 1995, a period they call the “six-year war.” They each brought their “war books,” thick binders in which they collected newspaper clippings, meeting minutes, fliers, cartoons, poems, letters, and many other materials. While I tried to begin at the beginning, they moved quickly through their life stories to bring us up to 1989. At that point, they narrated their experiences during this school board battle in great detail, which comprises nearly all of part one. Patsy’s involvement began when she noticed that the CSEA was receiving a poor contract despite the seeming wealth of the District. Her frustration began with her union, which she came to lead. Once she and Ida (who was already vice-president) started challenging sitting board members in elections, they were drawn into fierce battles with administrators, parent groups (including PICA, which later changed its name to BASTA), the Association of Mexican-American Educators (which they pronounced Ah-Mi), the El Monte Police Union, and many others. School board elections were held very two years, and for three cycles, conflict was intense. Key grievances were the sale of school board land to private developers and the spending of school board monies on lavish administrative facilities. After talking in detail about these experiences in the first track, we jumped around much more in the second track. 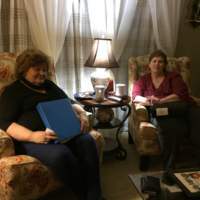 Patsy and Ida discussed how they came to work as aides, remembered interactions with students, parents, and teachers, and talked particularly about places for youth to go. They noted the declining enrollments in El Monte and attributed them to rising rents and expensive properties. They spoke about lost skating rinks and movie theaters, and lamented the lack of programming for youth today, as well as the lack of restaurants and supermarkets. They were also highly critical of certain gang-prevention efforts, particularly those of the El Monte Boys and Girls Club. Ida also spoke about her experiences as a longtime resident of South El Monte, which she feels is better off today than El Monte. Both women cited Legg Lake as their favorite place in South El Monte or El Monte. Ida also spoke about her high school years, and described old neighborhoods in South El Monte as well. We wrapped up with a discussion of schools and youth in the community today. The “War Books” are scrapbooks created by Patsy Sutley and Ida Werrett (whose book I did not scan, as it contained identical materials to Patsy’s book) to document their battles within, among, and over the Mountain View School Board over roughly a decade, from 1989-1997 (though the second book contains some material going up to 2004). The two women referred to these books regularly during our conversation, and these materials serve both as references for the oral history and as remarkable compendia of documents from an insider’s perspective. Among the items included in these books are newspaper clippings, school board minutes, campaign fliers, court cases, government and school reports, union correspondence, personal letters, school memos, poems, cards, and other printed and handwritten effluvia. The materials detail a series of elections, budget fights, and contract battles in the Mountain View School District serving El Monte and South El Monte, and they would be broadly interesting to anyone studying education, labor and public sector unions, community organizing, local politics, municipal finances, and childrearing in the 1980s and 1990s. Nick Juravich, “Interview with Patsy Sutley and Ida Werrett,” East of East, accessed April 22, 2019, http://semapeastofeast.com/items/show/20.